Description: The National Silent No More Awareness Campaign wants to share the truth with the general public about the negative consequences of abortion for women. The campaign is also reaching out to women who have experienced abortion, letting them know that help is available. The campaign is making the voices of thousands of women who regret their abortion heard nationwide. The Silent No More Awareness Campaign invites women who want to help get the truth out to display these products and register at their website to join them in being Silent No More! These Bumper Stickers will help carry that message and are a time honored way to get the message out to thousands of people with very little effort. Think of how much time we spend in traffic, at the mall and parked at sporting events! For more information see the Silent No More website at www.silentnomoreawareness.org. These bumper stickers are perfect for communicating to thousands of people that woman do regret their abortions. It can also plant the seed in an abortion minded woman that she may regret her abortion too! 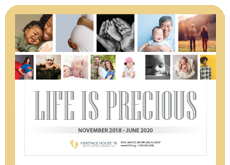 This bumper sticker includes the Silent No More Awareness Campaign website and this website identifies many healing resources for post abortive woman.